In beating Vancouver 3-0, Nicolas Lodeiro had a goal and two assists, Victor Rodriguez scored his first as a Sounder, and Stefan Frei recreated the magic of his MLS Cup heroics. The Sounders rediscovered their high-powered offense Wednesday night, thrashing the Western Conference-leading Vancouver Whitecaps FC 3-0 to end a 202-minute scoring drought and earn the first win in six matches. Nicolas Lodeiro had a goal and two assists as coach Brian Schmetzer shook up his formation. With Jordan Morris still rehabbing a hamstring strain, Schmetzer elected to put Clint Dempsey up top, allowing Lodeiro to play his natural attacking midfield role behind him. Victor Rodriguez played on the left, while Cristian Roldan was moved out of the defensive midfield to play on the right side. Schmetzer was pleased with the results. “It came from watching tape, trying to get our team on track,” Schmetzer said. “We had to make sure that the team bought in to it. This is how you jump-start something. Clint was on board, this seemed to be a good opportunity to roll it out there with four games left. The change allowed Roldan’s speed to provide greater width in the flanks, as well as allowing Jones to return to normal role at left back. Unable to clamp down on the narrow space normally occupied by Dempsey and Lodeiro, the Whitecaps’ back line could not trip up the Seattle attack by keying on one area of the field. The Sounders packed numbers forward in the opening minutes. Rodriguez put the Sounders (12-8-11, 47 points) up in the 17th minute. He picked up a ball from Lodeiro and dribbled free from a cluster of players atop the 18-yard line before slipping a shot on the ground past Vancouver keeper David Ousted just inside the right post. It was his first goal since joining the club Aug. 2. Stefan Frei made a spectacular save to keep the Whitecaps off the scoreboard in the 37th minute, jumping into the upper left corner of his net to tip a Fredy Montero free kick into the crossbar, before falling on the rebound. The save drew comparisons to his miraculous stop in the MLS Cup final that preserved a shutout and helped force penalty kicks. The save preserved Frei’s 11th shutout of the season and the 57th of his career, ninth-most in MLS history. 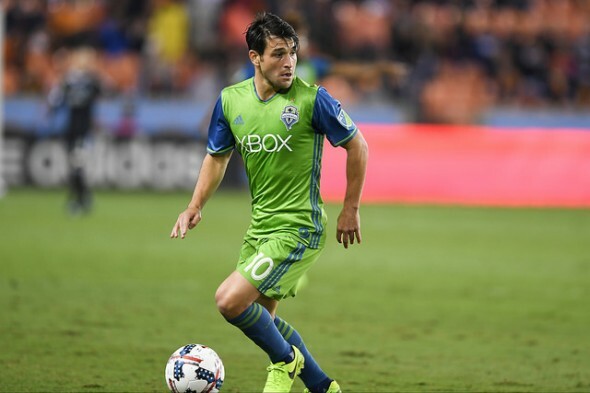 Lodeiro added a goal in the 62nd minute, picking up a cutback cross from Jones after Rodriguez broke free down the middle of the field. Dempsey added the killing blow eight minutes later receiving the ball off Lodeiro once more. Lodeiro, speaking through an interpreter, liked the new system that allowed him and Dempsey to occupy different spaces. Seattle had two injury setbacks. Captain Osvaldo Alonso was removed with a quad strain shortly before halftime and center back Roman Torres was forced off the field late favoring his left leg. Schmetzer offered no timeline on Alonso’s injury, but said that Torres would be day-to-day as the team prepares to travel to face the Philadelphia Union Sunday (10 a.m., ESPN). Late-season lineup shakeups normally are a cause for concern as playoffs loom, but Schmetzer’s decision to take the risk Wednesday put Seattle back on the front foot, one point shy of first place in the West.